This is an interactive and educative museum where you get detailed knowledge and information about the very tasty French berry that is popularly known as blackcurrant or Cassissi. Here they show you the past, present and future uses of this. The highlights are the set- ups of juice production and wineries inside the museum. It is a unique museum that focuses on a very interesting subject and is thus in the favorite list of many tourists. Free for children under 12 years. Special group rates are different. How popular is Le Cassissium? People normally club together Taste Burgundy Wine School and Nuits- Saint- Georges while planning their visit to Le Cassissium. Very interesting alternative to everything 'wine'. Audioguides available in several languages but not easy to listen to while the guide is speaking French. Definitely a must! The guide was super nice, and the tasting was incredible. If your are passing by, you should try the Super Cassis (great with white or red wine), le Birlou (great with beer) and Marcassin (perfect to drink as after dinner drink / digestive). If you are a fan of whiskey and scotch, ask for Marc. You will love it's smokiness and smooth taste. 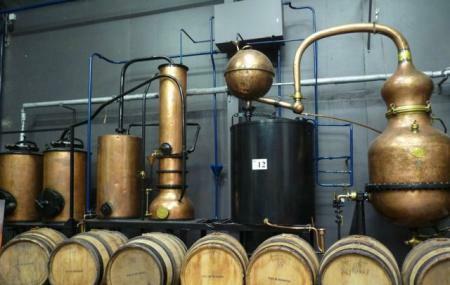 Nice tour in the factory, liquor tasting.